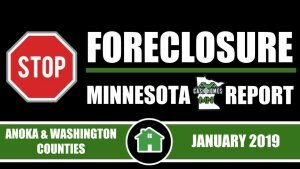 The Anoka County and Washington County, February 2019 edition, of the Stop Foreclosure MN Report focused on 9 properties that were scheduled to go to foreclosure auction via advertisement. These were in person auctions and held at the respective county courthouses. 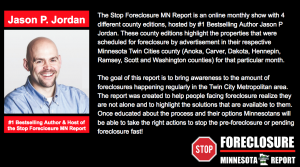 The Stop Foreclosure MN Report, hosted by Jason P Jordan, and sponsored by Cash Homes Minnesota provides awareness, education and solutions for Twin City homeowners in pre-foreclosure or anyone trying to avoid a pending foreclosure auction. Stopping a MN Foreclosure is important because it can have a lasting effect on your financial life. It’s important to move quickly and take advantage of any options available. You could save both your credit rating and remain in your home. Or the inability to pay an adjustable interest rate that continues to increase. Not paying your mortgage – no matter the reason – will red flag your account and can eventually lead to foreclosure proceedings. If you find yourself already in the foreclosure process, don’t despair. You certainly never planned on being delinquent on your mortgage payments or losing your home, but hope is not lost. The idea of losing your home is certainly stressful and scary but there are ways out of foreclosure so you don’t ruin your credit score or have a foreclosure on your record. Foreclosure is a stressful process may cause people to feel embarrassed or ashamed. Being foreclosed could result in someone isolating themselves or acting irrational. Most people when feeling overwhelmed with stress need relief and comfort. You don’t have to be a banker or a psychiatrist to help your friends and family in a foreclosure situation. The best way to start is by familiarizing yourself with the basics of the MN foreclosure process and the resources available to homeowners. Help Them Take Action Immediately. If the homeowner starts taking action right away then the more likely the foreclosure process will be stopped. The clock is ticking! Council them that avoiding the foreclosure process will not make it go away, it will only make it worse. Reassure them that true relief will come by addressing the problem and getting the needed the help. If you are facing an auction soon…you can sell your house for cash and stop the foreclosure dead in its tracks. If you are looking for help to stop an upcoming foreclosure feel free to call our “Stop Foreclosure Now” hotline immediately at 651-350-1931 …we can help you determine the right solution for your situation with no cost or obligation. Each of these county editions will highlight the properties that were scheduled for foreclosure by advertisement in their respective Minnesota Twin Cities county (Anoka, Carver, Dakota, Hennepin, Ramsey, Scott and Washington counties) for that particular month. The goal of this report is to bring awareness to the amount of foreclosures happening regularly in the Twin City Metropolitan area. The report was created to help people facing foreclosure realize they are not alone and to highlight the solutions that are available to them. Cash Homes MN is on a mission to revitalize each street, neighborhood and city in Minnesota, one house at a time. Founded in 2018 by internationally acclaimed bestselling author Jason P. Jordan, the company is willing to make a fair cash offer on almost any type of property in any condition and close the deal fast to help stop Minnesota foreclosures. The host of this report, nor its sponsors, are lawyers, and therefore do not give legal advice. Foreclosure is complicated and confusing. Make sure you understand the process and your rights by talking to a competent lawyer or foreclosure prevention counselor before taking any action. The views expressed in this report are personal opinions only and should not be construed as financial or legal advice for your given situation. While all attempts are made to present accurate information, it may not be appropriate for your specific circumstances and information may become outdated over time. The Stop Foreclosure MN Report does not assume any liability with regard to financial or legal results based on the use of the information provided here. This report is for informational purposes only and not presented as legal advice. Furthermore, advertisers, commenters, and linked sites are solely responsible for their views and content – which do not necessarily represent the views of the Stop Foreclosure MN Report or Cash Homes MN.